1,2, 2: winningest start to the season yet – Ride. Write. Repeat. The first race of the season is always a pretty good indicator of what’s to come. I’m one of those ‘winter worker bee’ types. Namely – I tend to scurry off at the end of the season, train steadily through the colder months – before emerging fully formed (or as fully formed as I’m going to get) come spring. I’m not going to get much better as the months drag on. Some riders are more likely to kick back a bit over winter… then absolutely hammer it as soon as the daffodils arrive. They start off so-so but are smashing it by August. If you’re looking to peak at the ideal time, that’s probably a better approach. For me, well – I’m a routine girl. Gentle upwards trajectory. I moved jobs – leaving my post as Editor at Total Women’s Cycling to be SEO Analyst and Cycling Weekly. I loved (almost) every second of my time at TWC, but it’s nice now to be part of a larger team. Plus I still get to write, but more in the style of choosing your favourite sweets in the pic’n’mix than all day… and Cycling Weekly has been my favourite magazine for a long time. I joined Norwood Paragon. Well, if you’re going to work for the comic, you might as well do it properly… No, that’s not it. I went on quite a few Paragon rides over winter. The guys are pretty fast, but also disciplined and they know a lot about race craft. Which is, coincidently, something I need to learn. Oh, and I finally decided to start listening to all the physios and experts who ramble on about core strength and actually DO something about it. Increased my plank from a meagre 90 seconds to a max of 3.5minutes. Did lots of reclining sit ups. Worked on my glutes with all sorts of elastic bands. It’s still not enough, because I’m hypermobile and need a stronger muscular structure to support my overly flexible joints (otherwise I’m like a big ol rag doll on a bike), but it’s a start. And I can honestly feel the benefits. The thing I didn’t change was track. 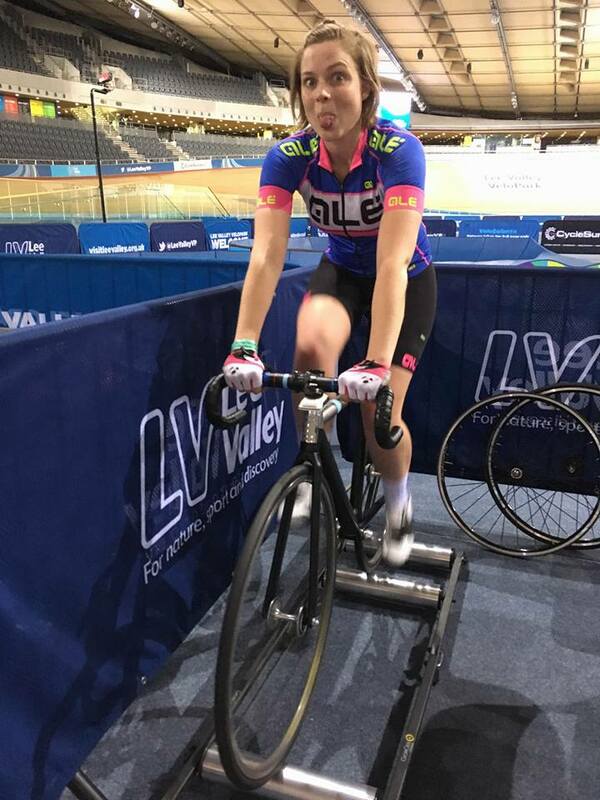 I started riding at Herne Hill (and sometimes Lee Valley) in November 2015 and basically fell in love with it. The endlessly elevated heart rates, spinning-so-fast-you-cant-see-my-feet (I imagine) and bike handling skills paid genuine massive dividends in 2016. Andddd it seems that’s not stopped for 2017. So – how has the season gone so far? I checked the course record before this event because I wanted to get an idea how sporting we were talking about. I clocked that the women’s record was 01.08.57, by Alice Lethbridge in 2015. Now, Alice is speedy. Riding for Drag2Zero this year, she’s one of these ‘riders to look up to’ for me. So I set myself an expectation of around 01.10+. 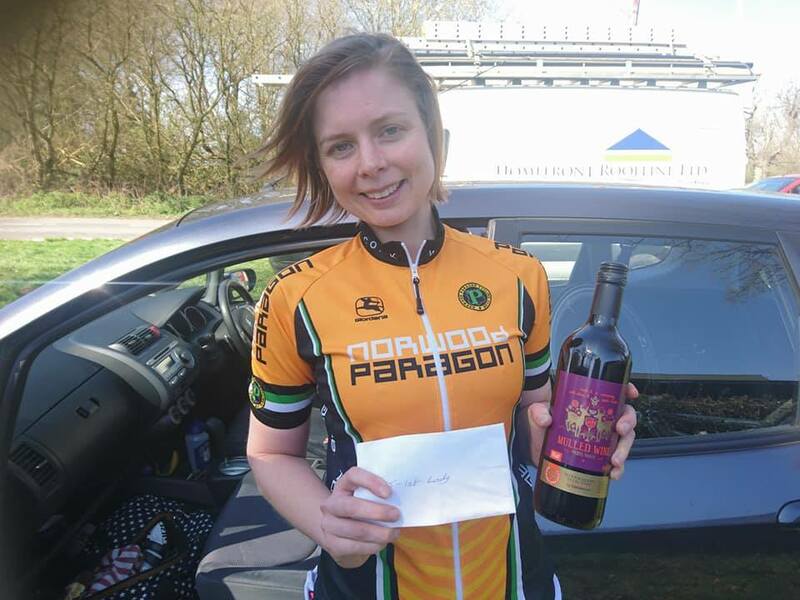 After all, Alice beat me by four minutes in the East Surrey Hardriders last year. Anyway. Arrived. Number on. Warm up. Line up. 3.2.1.Go.GoodLuck. My heart rate shot North of 180 and stayed there. It’s funny how you don’t time trial all winter, but it all just goes like clockwork once you’re used to the routine. 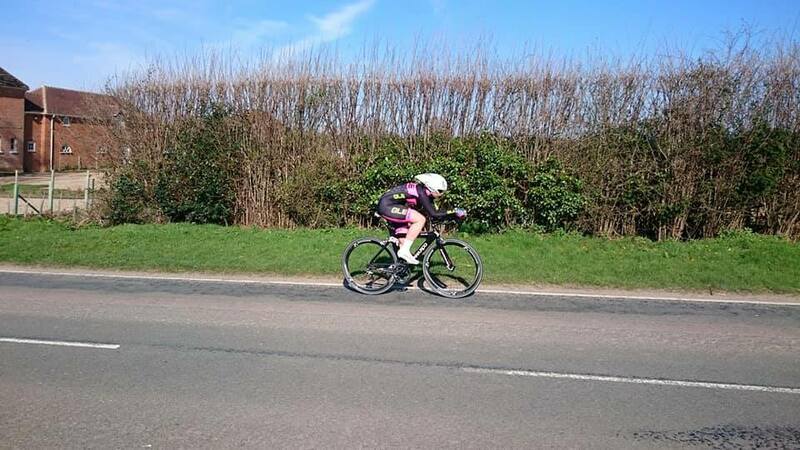 On a dual carriageway TT I’m aiming for sub one hour this year, so this was a slow but incredibly entertaining course. Not necessarily so hilly. But bumpy surface, turns, drags. Very swoopy. Very Wooahhh. Ouch. Ouch. Weeee (*tries not to freewheel*)…. I caught my minute man on the first section of rolling hills, maybe a bit under 10 miles in. About two minutes later he came past me on a descent. I let him go, and rode past him on the next hill. I hate it when this happens. In a TT you want to be sitting directly ‘on the read line’. Having someone leapfrog you means you have to ride over the red line if you want to shake them. Anyway, we passed each other a handful of times but were always careful to keep a distance. Or at least, I was. FYI, CTT rules state that once passed, you’re meant to let the competitor go. It’s one of those rules I think is ok to break perhaps once – especially on courses with varying terrain that might suit different strengths in different areas. But it kind of is there for a reason. Around half way round, I realised I was also half way into the course record time. I wondered if I’d gone off too fast. The final miles were an excruciating exercise in oxygen-deprived mathematics. 11 seconds is a pretty small margin, I’d either just manage it or just miss it. Depending how many minutes and seconds each mile took me. I crossed the finish line, and probably upset one or two of the time keepers with line-crossing expletives. Thankfully no one held it against me, and I’d done it. I don’t expect Alice had a good day in 2015 – I’m not that naive. And maybe the conditions favoured our 2017 ride. I notice the men’s course record was also broken, and with a 55 – but the difference between men’s and women’s times is nearly always greater on a sporting course. Regardless, matching the time of someone who was beating me by four minutes last year (which turned out to be my best year on the bike so far!) is kind of a good omen. Event number two. A crit race, so – well, probably not likely to go as well as the TT. The sun was shining, it was clearly going to be a beautiful day. The race was held on the circuit at Betteshanger Country Park . Not somewhere I’ve been before, but a really stunning venue with lots of entertainment outside of racing – including MTB hire and trails. The circuit itself is wide, smooth, with a nice double bend in the middle and a drag to the finish. Kinda of perfect, though a hillock or two might be nice. Though the sun was shining, I wasn’t feeling too beamingly happy myself. Reoccurring sciatica had been knocking on my door since Thursday and my calf felt like a small creature had its hand around the muscle and was clenching tight. 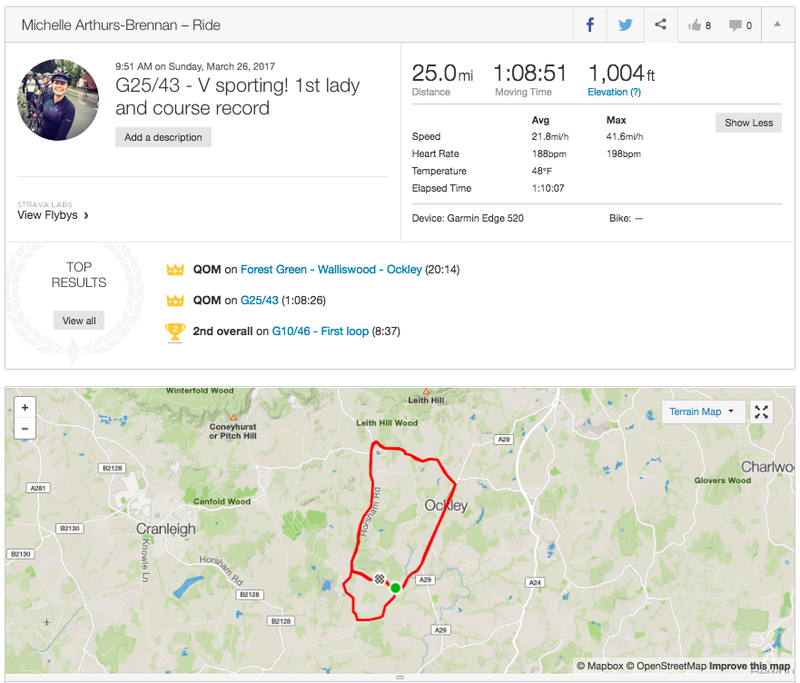 Almost didn’t ride, having spent the night with a hot water bottle on my bum – but decided to ‘see how it goes’. The field was fairly small – 14 or so. I thought the biggest threat was a girl from Team Vertex-Biemme. A bit of pre-race stalking showed me she’d raced Elite events in Belgium. Then there were 3 girls from Project 51 and 3 from Adalta. So if anyone had the numbers, it was them. It wasn’t the fastest race. My average heart rate was well below threshold, which isn’t really how I like it. There were a few attacks. But the field was pretty evenly matched so it didn’t feel like anyone was really attacking to get away. A shame, as a break on that course would have been a real pleasure. Sprint it was. I had Ms Vertex-Biemme down as our race winner, to be honest. So I found her wheel in the sprint and stuck to it. When the line came, I made a dash for it – and somehow seemed to be… riding past people? Typically, I’m not a sprinter. At all. But I got there, second. Which is my best finish in a crit by quite a long way. 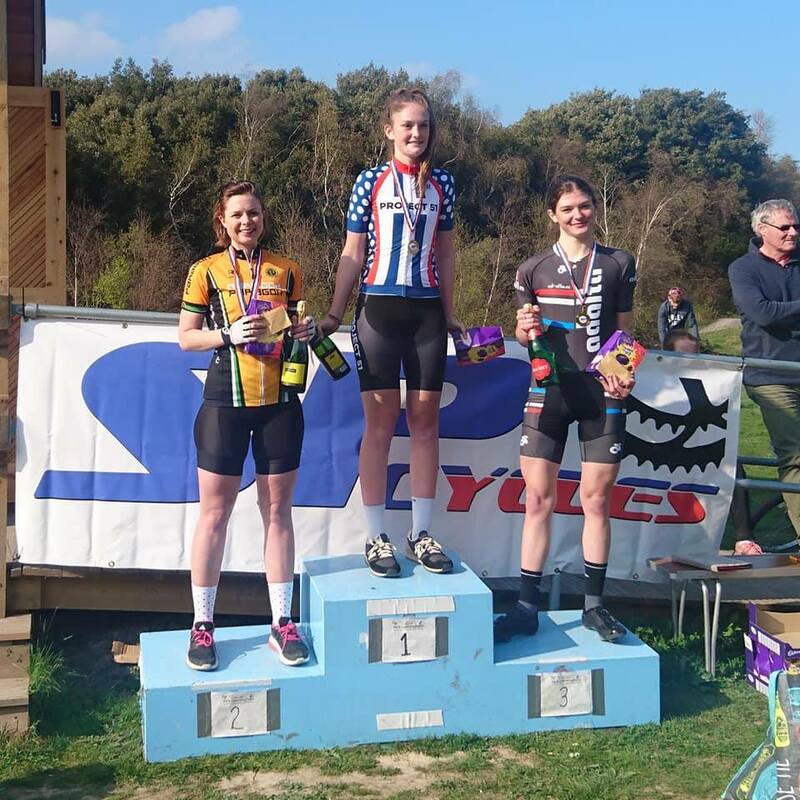 I chucked myself over the line just behind Josie Shepherd (Project 51) – who happens to be a junior but one who has had some pretty impressive wins in senior fields already this year. Maybe I got lucky. Maybe no one else has woken their legs up yet. Maybe it’s the repeated sprint efforts at Herne Hill Velodrome. Yea, maybe those have something to do with it. Another beautifully sunny day, this time at Lee Valley crit circuit. The start list contained seven riders, but being a London race I had every confidence at least three more would turn up on the day so we’d at least have full points (the Lovelo RR was the following day which maybe narrowed the field). I was right, three more did show up – but that was it, so we had a race of ten which was a tad disappointing. 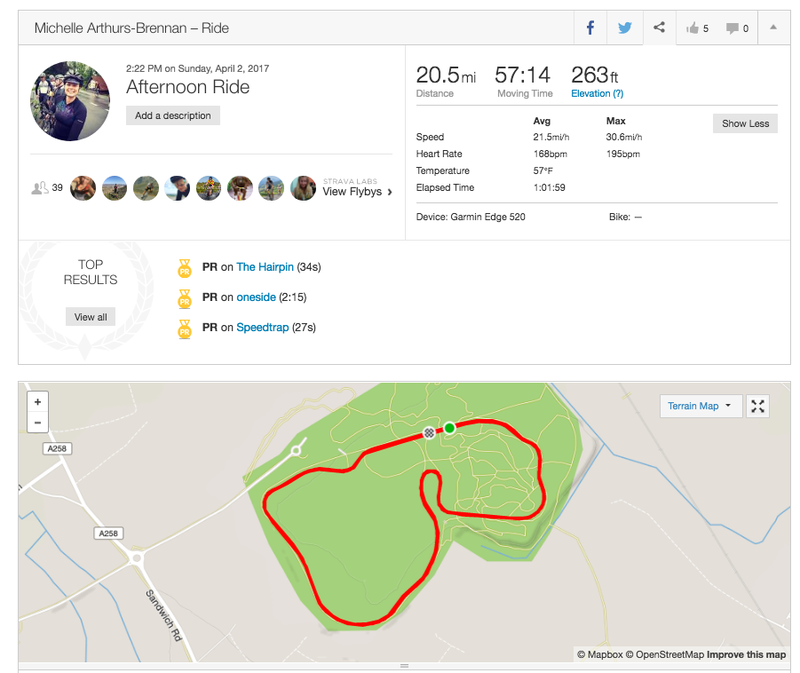 This said, it was a good field – including two Geoffrey Butler riders who I know well and a girl from VC Equipe – Flix with a note about oral hygiene sponsors splashed across her bibs. Intimidating stuff. After arriving two hours early (what the hell’s a girl to do ahead of a 4pm race? ), the start was delayed by 30mins – but that did entitle my legs to a nice long warm up. Spin ups done, reminder lap of the circuit – and we’re good to go. A race of this size could end up being pretty boring – there’s no real incentive to go hard, in fact we could just choose to roll around at club run pace for 40 minutes before sharing a mad dash for the finish. 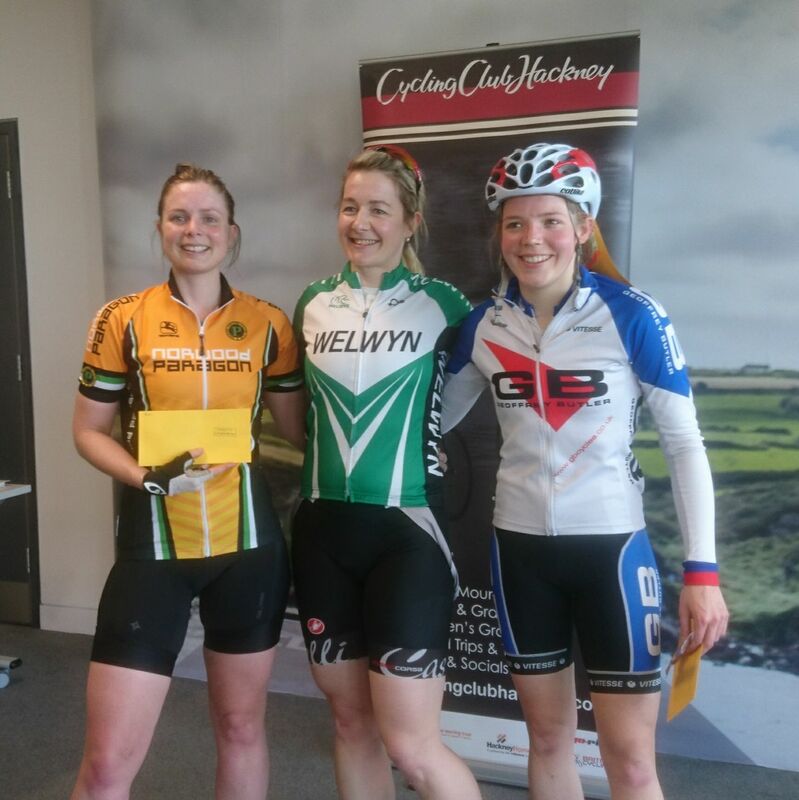 Thankfully, Katherine Broadbent and Michelle Forster (GB Cycles) were having none of that. I raced a lot with Katherine last year and she’s got a really recognisable kick – which she put to good use almost every time we reached the ramp in the purpose built track. Of course, every time she got tired, Michelle would attack – resulting in a race with plenty of peaks and troughs. At a few moments it seemed like we might escape the rest of them (I’ve shared a break with Katherine before and was more than willing to do it again) but again it was pretty evenly matched and nothing was really going to sway the hangers on. With 5 laps to go, the pace slowed right down. I’d kept myself fairly close to the front or at the front throughout and since we were hardly mashing it, I just assumed my position second wheel behind the oral health bibs for the remainder. Last lap, and girl-in-pink-on-Dogma made an attempted break on the ramp, I followed, punching a gap that wasn’t really there but quickly became available, and we had it all under control by the last bend. At Lee Valley circuit, you round one final corner, and then the straight to the finish is in sight. Well, this was bloody stupid. Legs: why are we doing this? Not much to do now but keep going.. Prepare to be dive bombed. No one has come past?! I’m basically on the line! …. And there’s one solitary deep section wheel in the corner of my right eye. I’d not seen the Welywn/Kinetic cycles rider throughout the whole race. Pretty much my first glimpse of her wheel was when it crossed the line just before mine. But then, that’s bike racing. You live and learn – and another second place puts me on 16 points – two thirds of what I need to get my second cat license in the bag for next year. Though the field was limited in size at this one, it felt like a pretty decent race and one that turned out to be pretty fruitful. I guess what was most notable was that I didn’t just line up to make the numbers, and though I was chuffed with second, I was just a tiny bit disappointed not to win. Which is oddly promising on the confidence scale. Herne Hill Velodrome Assos Women’s Track league. The field looks pretty epic, so basically I’m going to go and have fun and do my best. Hashtaglowexpectations. If you’ve read all of the above – well – wow, commitment. Obvs what’s probably got you here is simply scrolling down the page to see how long I’ve rambled for (I work in publishing I KNOW HOW YOU READ). Norwood Paragon is a great club. Heritage. History. Discipline. Support. Unfortunately, there aren’t many women racing for the club. That’s ok… but team mates would be nice! What tends to happen, at club level for women, is that despite being few and far between we spread ourselves out over several clubs. And wonder why we have no team mates. If there are any women in the Caterham/Reigate/etc vicinity, who feel that they’re a little bit on their own at an existing club, then give me a shout. It kind of makes sense that we try and make one club good for women, rather than have lots of clubs with just one or two of the species. Maison du Velo (the amazing bike shop where Paragon meet for club runs and where I mostly live…) have been organising women’s rides once a week (there’s a WhatsApp group for them I can add you to), and a group of those women (all different abilities!) are planning to ride the Norwood Paragon club TTs this season. Hopefully it’ll be a blast. The more the merrier.